Preventative Medicine In Dogs: Does It Work? Organic, natural, paleo, healthy, and GMO-free are terms that get tossed around in the veterinary community these days. Are these words simply designed to get you, the consumer, to pay more for products or is there truth in preventative medicine? That’s right: Living a less chemical lifestyle is not only better for you, but in the long run, better for your dog. In this edition of Medicine Versus Mom, we’re exploring preventative medicine: What is it? Does it help? Does it work? What is included? How far is too far with prevention? The costs of prevention are but a fraction of the cost of treating a disease or problem once it manifests to an advanced stage. Often times, when a disease reaches are later stage, the likelihood of a successful outcome decreases. Preventative medicine is way more than taking your dog for regular veterinary visits. Here are a few examples of modern canine preventative medicine. How many of these are you involved in with your dog? So that healthy looking dog galloping through a field of grass on the front of a bag of food is not always indicative of what the contents within that bag could do to your dog. Did you ever try to do the very best for your dog and feed him or her what you think is an awesome, quality food? As a result, did the dog ever not thrive on that food but perhaps got sick or developed other issues? Human Grade vs. Feed Grade Pet Foods: Which one does your dog eat? Made with human-grade ingredients does NOT mean a finished product is actually legally, human grade. An ingredient might start off being fit for people to eat it, but once it is shipped to a pet food plant and processed according to regulations for feed grade products, the term “human grade” can no longer apply. By true definition, that ingredient is now human grade. Quite the dose of reality, isn’t it? Click here to read more about human grade versus feed grade pet foods. Bottom line: A quality diet that is free of chemicals and is actually good for your dog is what we use and recommend. We allow our dog kibble for his brain games and board games at night on cold or rainy evenings. For his regular diet, we feed Dr. Harvey’s veg-to-bowl and a source of protein with an oil and we rotate with The Honest Kitchen dehydrated food, Embark flavor. Walk down the aisles of any major pet supply store and one can be easily overwhelmed by the selections. This is actually a really good thing for the pet parent, as we finally have selections. One size, color, shape, or formula does not fit all (just like the supplements aisle in human pharmacies and retail stores). Joint supplement: When choosing a product, it is best to use one that is recommended by a veterinarian and has been formulated specifically for pets. Occasionally, human products have ingredients that may be undesirable for overall pet health. Additionally, make sure that the product meets Good Manufacturing Practices (GMPs), as such certification provides higher quality control over products. We use Cosequin Advanced Strength and have for years. Our dog has had two ACL (anterior cruciate ligament) tears within one year’s time. We want those joints to be coated and to have improved mobility. I use the human version for my chest arthritis. I give my dog a half to one tablet a day crushed up on his lunch meal. Omega-3 Oil Supplement: Omega-3 fatty acids EPA and DHA are important fatty acids for both people and dogs because they cannot be made in the body. The only source of EPA and DHA for these species is through the diet and/or supplementation. Daily supplementation with Omega-3 Fatty Acids helps support optimal health, so we do that. The supplement we have used on our dog for years is Nordic Naturals Omega-3 soft gels. I use one capsule based on my dog’s weight and puncture the capsule on his food at suppertime. 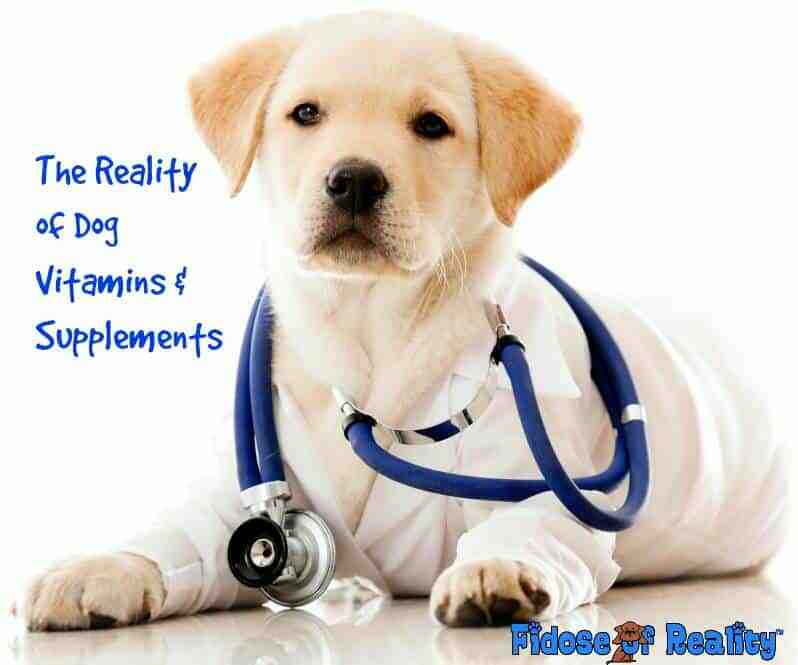 Read more about the reality of dog vitamins and supplements here. Want to avoid a ton of health problems and help your dog live a longer life? Keep his or her weight in check. According to a study by the Association for Pet Obesity Prevention, more than half of all U.S. dogs and cats are obese. It’s an epidemic. Ask your veterinarian to evaluate your dog’s size at every check-up. Once your canine has reached maturity, ask for his optimal weight. Talk to your vet: Ask why the dog is overweight. It could be an underlying medical condition. If health issues are ruled out, portion control and rewarding with things other than treats. Click here to read how to safely help your dog lose weight. If I had a quarter for every time I heard a pet parent tell me their dog is bored or won’t play any longer because “he’s getting older,” I’d be able to buy a small chain of pet supply stores. We don’t stop playing because we grow old. We grow old because we stop playing (said a famous person). Spend at least 30 minutes twice a day in solid play, walk, or engagement time with your dog. When my dog was recovering from surgery ,we were given strict rest orders, no jumping, no playing, and certainly no long walks or running at the park. Although we had to be careful, I knew that if I didn’t keep his mind stimulated and in some way, shape, and/or form, he would become depressed. Being depressed as a human being actually weakens our immune systems and makes us more prone to illness and disease, and since dogs are our counterparts…. you know the rest of the story. Click here to read what about activities to do with your dog. Does he need 100 toys in his basket of goodies? Probably not, but he would love if you picked up a toy or two and engaged in play time with him minus the cell phone or any interruptions. Mental activity is crucial in the world of preventative medicine. My previous dog had a side effect to then yearly vaccines. That side effect was cancer. We over vaccinate our dogs (and cats) in this country. Plain and simple: Overvaccination and the horrible side effects of this practice has become an epidemic of alarming proportions. We think we are doing right by our dogs by giving them vaccines and keeping diseases from affecting them. This is not always the case. I am not anti-vaccine; I am anti over vaccinating. Vaccines are not evil. According to research Dr. Dodds shared, thanks to vaccinations, historically more lives have been saved and more animals have been safeguarded than any other medical advances. Canine vaccinations have significantly reduced endemics of canine distemper, hepatitis and parvovirus but NOT in wildlife reservoirs. Here’s the catch: Vaccine companies make excellent products, but they aren’t one-size-fits-all for every dog. Click here for read more about whether your dog needs vaccines or not and how often. So yes, preventative medicine is crucial to have a healthy, happy dog. That whole ounce of prevention being worth a pound of cure has a ton of merit. Preventative medicine seeks to prevent disease versus treating it. We’re all for prevention, how about you? What Does an Experienced Vet Tech Think? Twice a month, Rachel Sheppard of My Kid Has Paws is taking the side of “Medicine” to our “Mom” and giving you her perspective on the same issue. Please check out the vet tech side of things on vaccinations and head over to My Kid Has Paws for more information on this topic. Note: We cannot guarantee results for your dog, but Fidose of Reality believes in sharing what works for us and then allow you to make your own informed decisions in conjunction with your dog’s healthcare providers. In what ways are you involved in preventative medicine with your dog? What has worked for you? We eat a really good food, get lots of fresh air and exercise, and take supplements, but when a virus is going around at daycare, sometimes it is just too much and Bailie brings it home and now I am sick too and we are spending now two weeks pretty much quarantined. BUT, we rarely ever get sick, so I think a healthy life style with some help from supplements definitely pays off. You are so right, Emma. I see what other dogs my Dexter’s age are dealing with and a lot of times, things are genetics. But a lot of times it is all about a healthy lifestyle. And our supplements have helped big time. If my vet ever recommends anything like this, I will definitley consider it! I find that a lot of times I go into the vet with these suggestions and he really gets on board and is happy for clients with open dialogue. I have learned so much from your site that I feel like when we get our puppy we will be totally ready! I can honestly say that Bentley and Pierre are much healthier since I began feeding a quality dog food, adding supplements and hit his target weight. We say no to chemicals as often as possible. We have been thinking about trying coconut oil for our dogs, especially the senior doggy! Nutrition is just as important for the furry members of the family as it is for us. This makes a lot of sense. In a lot of ways it’s just part of a healthy lifestyle along with exercise and healthy food choices. We gave our Newfoundland so much preventative care and it definitely paid off. She was outlived the life expectancy of her breed. we got tired of wondering which food was going to get recalled next or what was really in our dogs’ food so we started making their food out of human food. We use our own beef (one of the benefits of living on a farm) as well as our own vegetables. We know they are good quality and chemical free. Our dogs look much healthier now and their coats shine! That is fantastic, De! We do a lot of home cooking and we love our supplements. We recently switched our dog over to grain free food. It’s helped prevent skin allergies so I guess that counts as preventative medicine! I think you really can prevent illness in dogs and humans alike with proper nutrition! I will start adding organic coconut oil to my pets diet to see if they can reap the benefits from consuming. While the goal of preventive cRe is to avoid issues all together, even when they can be delayed it has it’s benefit. We, of course use weight management, exercise, physical and mental stimulation, good food and some supplements. Regular wellness exams are also an Important part of prevention of big issues. I think one of the best preventative medicine is simply bringing my pets to the vet on a regular basis. I had not thought about preventative medicine for dogs. But it does make sense to give them supplements, better quality food and the like in order to maintain good health. You’ve got a lot of great information here for dog owners. I don’t own a dog, but if I ever do I’ll be sure to refer back to your blog post. Very helpful. It can’t hurt, right? I saw a blog post earlier today for herb supplents in dog food. I’m happy things are more proactive now for pet care/diets than they were years ago when I was a kid (and we had dogs). I give my dogs herbal supplements and I’ve always been told that an ounce of prevention is surely better than a pound of cure. I am really glad that you included mental stimulation! That is something that is often forgotten, but incredibly important and powerful for the health of all pets! Dexter is so handsome! I am considering preventative meds for my dogs, and was discussing some bone and joint help for them today. I am just so leery that I may choose the wrong supplements. Good information here! Thanks, Elizabeth. Glad to help!